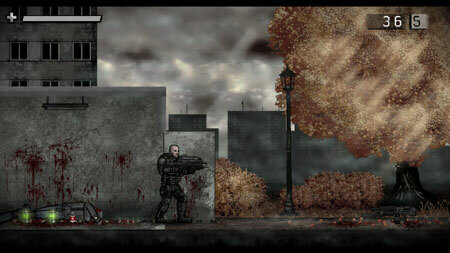 Leaden Sky is an upcoming side scrolling run n’ gun shooter developed by Helghast_95, with an emphasis on brutal gore mechanics, and visceral, horrifying action. The game demonstrates the gore system, and allows you to get a sense of the atmosphere early on, allowing you to become a vital part of the development process through the vast community surrounding the brutal side of shooters. While what is to offer at the moment is quite barebones compared to what is planned, it should provide you with the attitude and overall feel of Leaden Sky. If you get stuck in the game, check out the video walkthrough and gameplay for the game. This entry was posted in PC Games, Walkthrough and tagged Leaden Sky Cheats, Leaden Sky Game, Leaden Sky Gameplay, Leaden Sky Guide, Leaden Sky Hints, Leaden Sky Review, Leaden Sky Solutions, Leaden Sky Strategy, Leaden Sky Tips, Leaden Sky Walkthrough by Marvin. Bookmark the permalink.